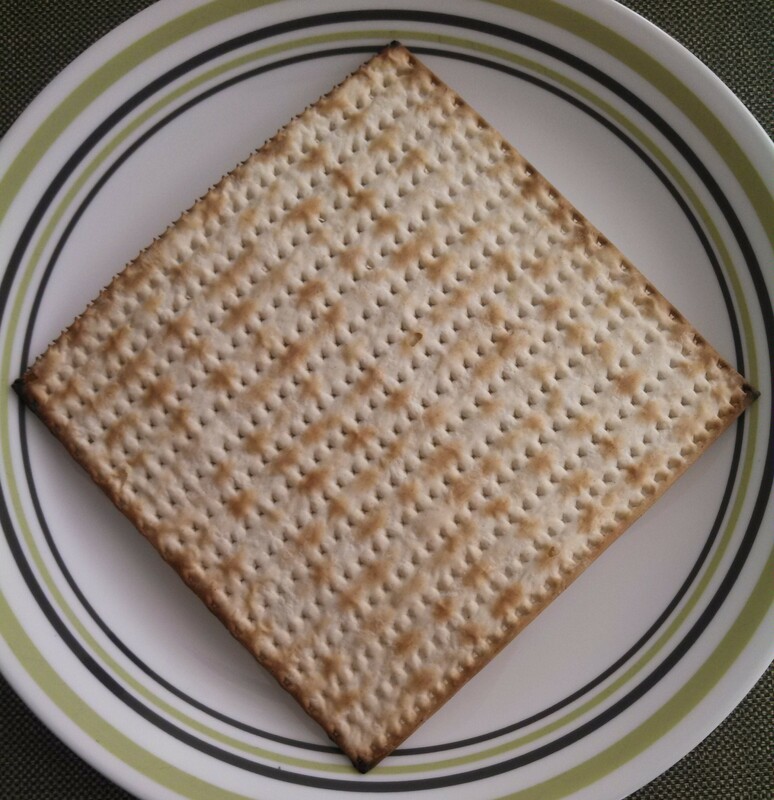 Have I ever told you about the year that that our search for the afikomen (a piece of broken matzah that is hidden during the Passover Seder for kids to find and subsequently ransom, because the ritual meal can’t end until everyone takes a bite of the afikomen) took four months? It is a tale of mystery and intrigue and military movers that spanned 1,400 miles! Back in 2008, when the glitter of Sampson’s newly-awarded Navy Wings of Gold was still a dazzling novelty on his uniform, we were getting ready to ditch South Texas for glamorous Norfolk, Virginia (well, it had to be more glamorous than Kingsville or Corpus Christi). Eager were we to leave behind the grind of flight training for an exciting life of… well, more flight training, but this time in a haze-grey Fleet Replacement Squadron aircraft with wings on one’s chest instead of in the clown-like orange-and-white birds of the training commands wearing a sad, wingless name tag. 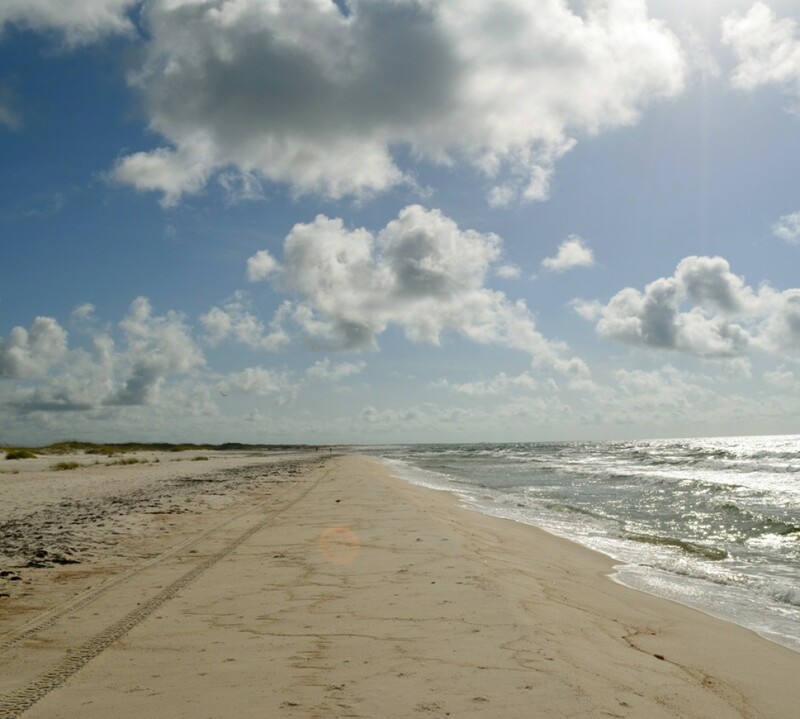 Before we could start that thrilling new chapter, though, we had to get ourselves and all our worldly possessions from the Gulf Coast to the East Coast. That meant military movers. When Uncle Sam is picking up the tab, you don’t exactly get to shop around for the best moving company on the block; the government’s primary criterion for its choice of relocation contractors seems to be the price. Our much-anticipated pack-out day, which fell during the middle of Passover, was fraught with a number of issues that one might expect when dealing with the lowest bidder, not the least of which was the driver forgetting to bring the key to the back of the truck so that the boxes and furniture could be loaded. The wait while someone went to fetch the key would have been no big deal, ordinarily. However, for reasons known only to them, the movers had decided to stage all the boxes and furniture outside on the lawn. That would have been no big deal if thunder hadn’t started rumbling and the clouds hadn’t begun to threaten everything we owned with a thorough watering. Luckily for us, someone returned with the means to open the truck so that loading could commence, and they managed to get everything safely aboard the truck before the skies opened up and soaked our stuff. Still, that last hour or so of willing the rain not to fall had added even more stress to what is never a relaxing day under the best of circumstances, so we were doubly relieved to see the truck drive off. Exhausted, we went back inside our empty house to grab a snack of matzah we’d stashed with the “Do Not Pack” collection of snacks and drinks we had left on the counter for the packers and movers. Though the other snacks remained, the box of matzah — our last one — was nowhere to be seen. We looked through drawers (empty), the fridge (likewise), cabinets (also no joy). “They must have packed it by accident,” said Sampson, shaking his head. And now it was on its way to storage in Virginia until we had a house to which our stuff could be delivered. “This is going to be the longest afikomen hunt ever,” I said, through giggles of disbelief bubbling up from the dregs of a long, long day. In the end, I won the prize–the long-lost matzah turned up in a box of miscellaneous kitchen stuff. Matzah being what it is, its apparent condition was indistinguishable from when it had been packed four months prior, but neither of us was particularly inclined to put it to a taste test. 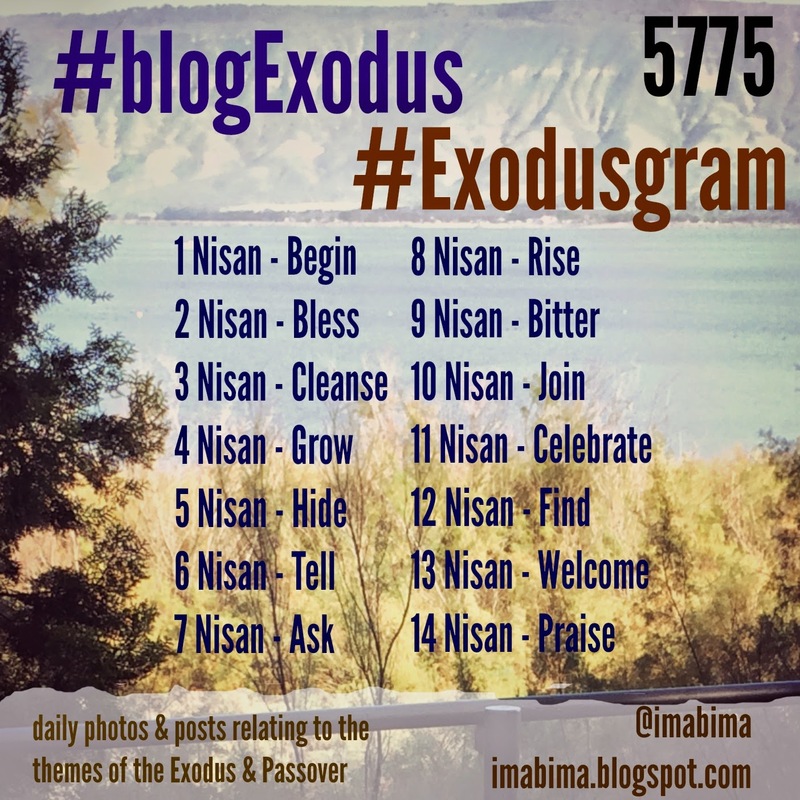 #blogExodus, the brainchild of Rabbi Phyllis Sommer, invites participants to chronicle the weeks leading up to Passover through blog posts, photos, and other social media expressions. My husband was kind enough to allow me to share the story of how he joined together with his Jewish community aboard the USS Enterprise despite the difficulties of deployment in the spring of 2011. I’ll turn it over to him for today’s post. Enjoy! I knew before the deployment started that celebrating Passover would be a little challenging. But, like most things, it’s just a matter of finding the community and going for it. The Navy is very good about arranging to have rabbis come out to forward deployed areas for Jewish holidays. The only question that remained was whether to enjoy the holiday aboard Naval Support Activity Bahrain or try to stay overnight on the Enterprise. I made that call once I saw an old friend from Jewish Midshipman Club (JMC) aboard the ship. He was a submariner on a shore tour. But, since he was attached to the destroyer squadron as an undersea warfare specialist, it was one of those deploying kind of shore tours. So, counter to every single bit of COD guy training I had received since officially becoming a COD guy, I asked our officer in charge if I could stay aboard the ship for a night. On purpose. No mission requirement for such. He didn’t see a problem with it. I rode in the back of the COD out to the ship. As I was walking through the Air Transfer Office shack, I spotted a man with a black kippah on his head. This, evidently, was the rabbi. The ATO shack is where all passengers going onto and coming off the ship via aircraft muster. He had conducted a pre-Pesach Seder the day before, with the intent of celebrating aboard NSA Bahrain on the actual day. But, he assured me there were plans to have a Seder-in-a-box shindig aboard the Big E.
I ran into one of the ship’s chaplains who got me the time and place for the Seder. We managed to snag the captain’s in-port cabin. Nice! With this critical question answered, I spent most of the day getting a sunburn out on the LSO (Landing Signal Officer) platform watching recovering aircraft. I even got up there to see a night recovery for the first time. The night was absolutely gorgeous. A full harvest moon hung lazily on the horizon directly behind the aircraft coming in on the approach, illuminating some distant clouds. Directly over the ship, it was painfully clear, a million stars lighting the night. Seeing flight operations at night is one hell of an experience. On the cat shot, the afterburner seems to leave a trail of fire behind each jet. For landing aircraft, even with our exceptionally bright night, at first all you see headed towards the ship are a series of position lights. The LSOs record which wire the aircraft caught for each pass. In the day, it’s a trivial matter to see. At night, you have to catch seeing the sparks next to the capstan for whichever wire plays out. Once we completed the recovery, I went down to the in-port cabin. The captain’s cabin was set up with a white lace tablecloth and plastic dinnerware. Two huge boxes contained our Seder supplies. For karpas, there was raw onion. The charoset was this compressed stuff that looked like a PowerBar. The maror was in little single-serving packets. There were the obligatory boxes of matzah, plus round matzah, which I had not seen before. There were a bunch of plastic Seder plates as well. For wine, we had enough boxes of grape juice to supply a third-world country. If the supplies were a bit, ah, expeditionary in nature, the company was fantastic. My friend from JMC showed up. A department head from HS-11, our helo squadron, was the only other pilot. There was a lieutenant from Supply who was born in Columbia and raised in Venezuela. The Seder was led by an Intel ensign. On the enlisted side, there was one guy from the ATO with whom my detachment worked all the time, so that was another familiar face. There were four ladies, three of whom were nukes, one of whom was not actually Jewish, but came along to support her friend. The Seder was conducted a bit quickly. Most of the crew had done a pre-Seder with the rabbi the previous night that was exceedingly lengthy. Just as we reached the Festival Meal, an alarm sounded over the 1MC. When a man overboard happens, it is necessary to account for every individual aboard. The boat exploded into a controlled kind of chaos. People in shower shoes and bathrobes started moving towards their work centers to muster. With my detachment not aboard, I didn’t actually have anyone with whom I had to muster. 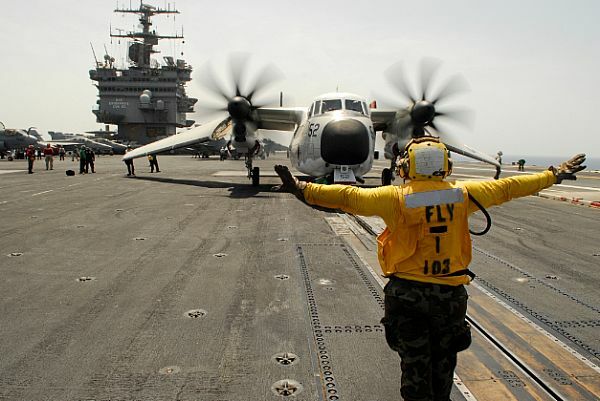 I decided to go down to the VAW-123 Screwtops ready room since the ship’s E-2 squadron is who typically takes care of us. We watched the action on the PLAT camera as the helo spun up. On the water, someone had dropped flares to mark the position of the unfortunate individual. The helicopter lifted, cut back and forth several times, and within thirty minutes, plucked the man from the Arabian Gulf. Later we would find out that this was a suicide attempt. Actually, many Jewish holidays fall on good nights for a high probability of rescue from the sea. That full moon provided 99% illumination. When the person you’re looking for doesn’t have a float coat, cranial, or any other reflective material, you need all the help you can get. We returned to our Seder once the action stopped. There was no real Festival Meal to speak of, so after helping the mess cranks clean up, I went down to Wardroom 2 for some midrats. There are two basic foods aboard a ship that are almost always going to be delicious: omelets and soft-serve ice cream. The ice cream is called dog. The machine has an arm you lift that looks like a tail. Lifting the tail of the dog to get some ice cream is an appropriately crude visual metaphor for the environment. I don’t know how exactly, but I definitely want to integrate these foods into my Passover tradition from now on. It was a wonderful experience to celebrate the holiday underway, about as close as one could get to celebrating with family while thousands of miles from home. It can be a strange thing to be a Jew in the service. You are a minority among your fellow sailors and the Jewish population at large. But, I just can’t see doing it any other way. I am a long way from home through this weekend, on a trip whose entire purpose is to ask questions. For years, I have been daydreaming about the possibility of one day applying to rabbinical school, and that “one day” isn’t so far off anymore. I’m visiting one of the school’s campuses this week, to meet faculty and staff and current students and to see if I could envision myself among them. Today was filled with asking, and my mind is buzzing with new information (or possibly the unaccustomed Cherry Coke I had with dinner). 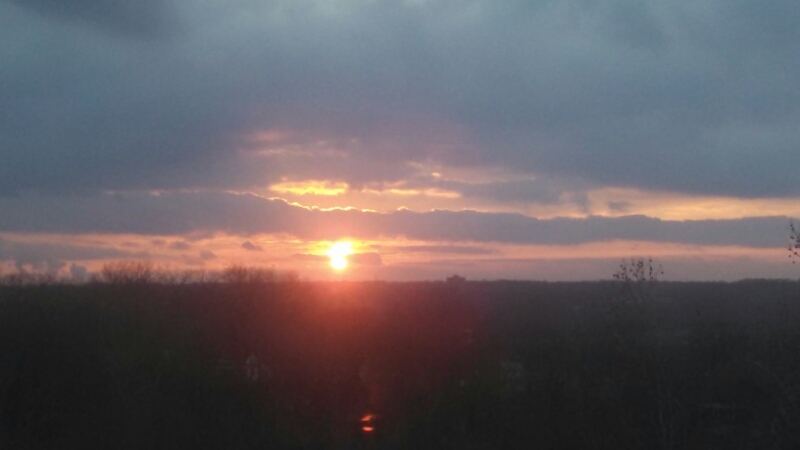 It rained and got progressively colder while I moved between classes and lunch and meetings, but the dark clouds that held court throughout the day were not so boorish as to withhold the sunset. The only other thing I could ask of today would be a camera to capture the brilliant pinks and oranges that apparently exceed my phone’s capacity. That’s what we’re saying when we sit down at the Seder table and open up our haggadot. Whom are we asking to tell us that story, though? A Seder is not a recital, with a performer on stage and a quiescent, politely attentive audience there to listen only. Passivity has never been the watchword of the evening at any Passover Seder I have attended. If we want to hear the story of our ancestors’ liberation from Mitzrayim, from their narrow places, we must listen to our own voices telling it. Sure, other guests will take turns reading this section or that aloud, in confident Hebrew or soft English, so our vocal cords don’t wear out before the last cup of wine and the final verse of “Chad Gadya.” Even when it’s not our turn to speak so the whole table can hear us, we could be as invested as if we are telling the tale. When it’s our turn to read a passage, we could try to hear our own voices with the anticipation of a child for her favorite bedtime story. We are tellers and listeners at every moment. At the Seder, we are each of us asking something within ourselves to tell us a story, and that inner something obliges. Have you ever taken steps to hide your religious identity? Was it because your physical safety was at stake if the wrong people found out? My husband is a Naval Aviator. Due to the location of forward logistics sites for his fleet squadron’s detachments, he chose to keep the fact that he was a Jew hidden while he was deployed. I talked with him a little about his experience with flying under the religious radar. Thanks for this exclusive interview, honey. When was the first time you considered that you might have to hide that you were Jewish? It really was preparing for a COD deployment… realizing that my base of operations wasn’t going to be with a bunch of other military personnel, it was going to be living out in town in an Arab country, not on a secure base. It was just a regular hotel room. It’s sort of a different thing than being on a forward operating base where you and all of your closest friends are carrying rifles. We were guests in a country that is by and large friendly, but the fact is there were some people there who might have actual, serious, no-kidding problems with Jews. I had no way of knowing who might hold these feelings and who might take it far enough to act on them if they found out I was Jewish, so I kept it quiet. What were the steps you took to obscure your religious identity? I got a set of dog tags that said “No Preference” instead of “Jewish.” I went through the luggage I planned to bring and made sure that I hadn’t left a kippah or other piece of Judaica in there… I kind of sanitized it. And when I gave out the FPO address to friends and family, I asked them not to send me anything for the Jewish holidays. That last part bothered me more than I thought it would. It seemed like everyone else had all these cute ideas for care packages for Easter or whatever, and it didn’t even occur to them to worry about it. Well, probably it was assumed that if service members were American, they were Christian. That didn’t necessarily add any additional animosity on top of just being American. In fact, I had a friend who got sick and was stuck out in a hospital out in town. He’s Christian, but he happened to have the middle name “Abraham.” He was asked point-blank by his [local] nurses, “Is that the Muslim Abraham or the Jewish Abraham?” He definitely got the sense that the “wrong” answer would have created problems. Did you feel like you were missing out by hiding your religion while deployed? It felt like I kind of turned off being Jewish for a while. It’s not that I didn’t get to celebrate Passover, but I had to get myself into a safe place — either inside the gates aboard the American base or, as I did for my first deployment, out to the aircraft carrier at sea. Even something as simple as bringing my own kippah — I couldn’t do it. I couldn’t bring a prayer book or anything. I honestly don’t know how often I would have cracked it open, but there was no question, it wasn’t an option. It wasn’t strictly about my safety. It might have made the people around me bigger targets, as well. It did make me sad, because I thought about some of our forebears who went and fought in WWII and asked themselves the same question, Most of them kept their Jewish preference on their dog tags. But, the threat that they faced was a little different. I was in a friendly country, just with the understanding that a terrorist-type attack on Americans could happen. The ones who went overseas in WWII knew that they were going into hostile territory, and their plan was to get into a fight. So, would it have been easier if you were on the carrier the whole time? For the sake of getting to have a Jewish identity while deployed? Yes. I would have been able to bring whatever Jewish items into my stateroom that I needed, and I would have been surrounded by friends. I should hasten to add that everything else about living out in town was way better. There were many wonderful restaurants, which meant that when I wasn’t flying, I got to eat delicious meals instead of being stuck with Boat food. There were great businesses run by really nice folks. I enjoyed talking with them, but they didn’t need to know I was Jewish. How did you feel when you got home (other than thrilled to see me, of course) and could be “out” as a Jew again? Getting home really made me appreciate the wisdom of the founders of this country. Separation of church and state helped to make a space where people of a wide variety of beliefs actually could live together in harmony, and not by one group completely hiding who they were to fit in with the rest. Amen. Thanks so much for sharing your perspective with me and letting me put it up on the blog. Spring is the season of sprouting, of tender new growth stretching toward the sun after dreaming beneath the earth through the darker, colder months. I think we are past the danger of a hard freeze here in the Florida panhandle, and all around us are blossoms and soft new leaves. Also, the weeds we call a lawn are greening right up, so the yard looks more alive than it has in months. Voracious little buggers, and devilishly hard to spot. An experienced gardener I am not, but I managed to grow some cherry tomatoes and herbs out on the patio last year. There is something deeply satisfying about eating something we picked right outside our own back door, and I look forward to snipping basil and thyme for our cooking throughout the coming spring and summer. 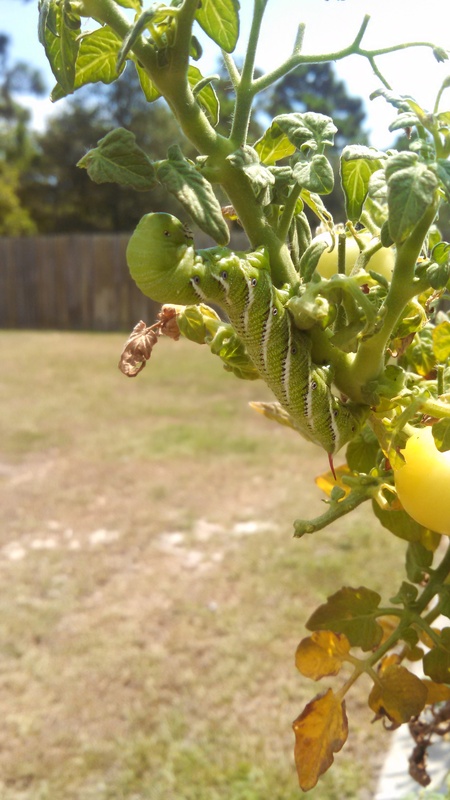 We will probably skip the tomatoes this year, as the constant struggle against hungry tobacco hornworms got pretty old last year. The daily search for gigantic freaking caterpillars as long and thick as my finger (I leave it to the reader to guess which finger) that still somehow manage to camouflage themselves almost perfectly in the foliage is something I can cheerfully do without. Herbs, though, are low-maintenance and give excellent culinary bang for the effort. I was delighted to see that, in spite of a winter’s complete and utter neglect, my pots of spearmint and thyme survived well enough to put out a few tentative shoots for a new season. I may be a suburban modern for whom growing edible plants is a hobby rather than a subsistence necessity, but I still delight in the feeling of connection to the agrarian rhythms to which our forebears shaped their lives. 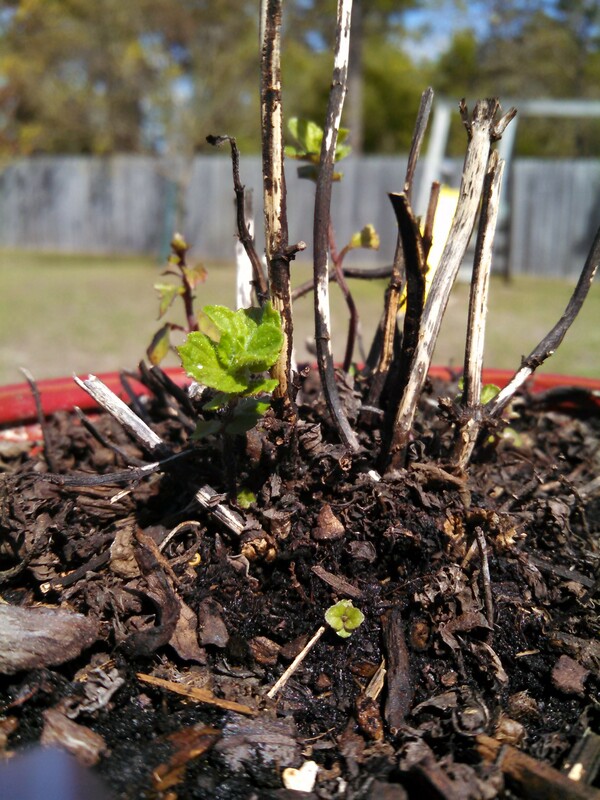 Sprouting spearmint, making me dream of future pitchers of iced tea. I ought to be well on my way to cleansing my house of all traces of chametz, leavened grain products, but I’m almost assuredly not as far along in my religiously mandated crumb search-and-destroy mission as I could be. Better turn in my balabusta credentials before someone notices that I’d rather bake bread than obsess over the fact that enjoying such might leave a bit of floury evidence thereof in odd corners. We have made some progress in clearing out a few things, such as a big pile of electronics that needed recycling, and it does feel good to reclaim the space — both mental and physical — it had ballooned up to fill. We have a ways to go before we’re ready for the mini-exodus that is military move, but given that it’s going to happen sometime between this Passover and the next, it’s not too early to look around with an eye toward cleaning out that which no longer serves.